Online ShopHome » Products » Norma American PH .223REM 53gr SP – $20 Pack & $179 Carton. Norma American PH .223REM 53gr SP – $20 Pack & $179 Carton. Norma Precision, that defines the quality of components and loading selected for Norma’s American PH line-up. 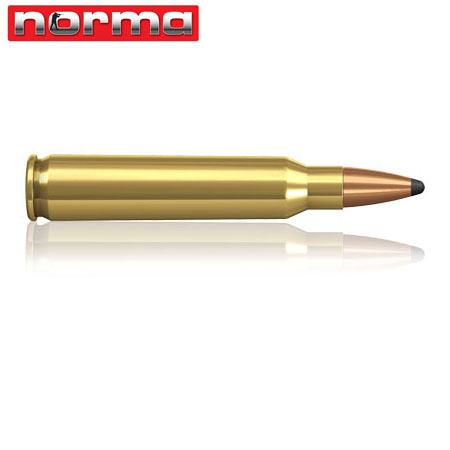 Norma’s tried and true Oryx bonded bullet’ for max penetration and near 100% weight retention. To insure perfect mushrooming, the Oryx has a thin forward Jacket with internal splitting zones and a thicker rear jacket to insure high residual weight after impact.The Oryx has rapid expansion, excellent penetration and high energy transfer. Perfect for the North American Big Game hunter! The lead free Kalahari’a lighter bullet that is designed with higher velocities for a fl atter long range trajectory. Loaded under the strictest standards , this unique bullet is loaded with selected lots of powder to insure the highest velocity for fl atter trajectory. It has the highest ballistic coefficient possible and lowest wind drift achievable. Bullet expansion is controlled and restricted to insure maximum wounding effect and guaranteeing deep penetration. Kalahari sets the standard for ammunition used where challenging environments and long shots are required! Norma Precision’the right ammunition for the Professional Hunter. Shortly after the introduction of the .222 Remington experiments began to make a similar cartridge for military use. The advantages were obvious as a soldier naturally can carry many more rounds of a much smaller and lighter cartridge. Drawbacks was the reduced long range potential of the smaller bullet and its lesser penetration. The first .223 appeared in 1957 and was mainly the work of Robert Hutton of Guns & Ammo and Gene Stoner of Armalite. One of the requirements for the new cartridge was that it could retain a velocity exceeding the speed of sound at 500 yards. This was not possible with the .222, but with its slightly longer case and a 55 grains boat tail bullet the .223 met the demands. The cartridge was adopted by the U.S. Army in 1964 and used in the Vietnam war. Since then it has been adopted by NATO as a standard military cartridge, but with a heavier 63 grains bullet which demands a quicker twist (1 in 7”) than used in most sporting rifles for the civilian market (1 in 10, 12 or 14”). The dimensions of military chambers and cartridges vary slightly from the sporting version that was brought out by Remington shortly after the .223 was adopted by the military. Accordingly military ammunition might produce high chamber pressure in sporting rifles. Military cases quite often has thicker brass and starting loads must be reduced by at least 10 per cent. For sporting purposes the cartridge is normally at its best using bullets of 60 grains or less. It is suitable for the same range of purposes as .222 Remington, and will add some yards to the effective range. Due to the adoption by NATO the .223 is expected to be the more popular choice in a few years by European shooters. Nosler 224 40 Grain Ballistic Tip Projectile. Nosler 308 150 Grain Ballistic Tip Projectile. 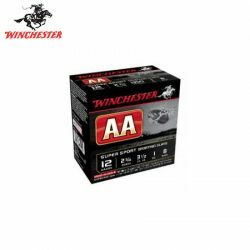 Winchester AA Super Sporting 12G 8 2-3/4″ 28gm.